Elena Procuta was at a meeting with government and non-government agencies where conditions in evacuation centres were discussed. Government figures showed 4500 people being housed in 108 evacuation centres around Tonga, since Cyclone Gita made landfall there on Monday night, ripping roofs off houses, destroying crops, and destroying a church as well as Parliament House. Previous experiences had shown women and children could be susceptible to physical and sexual abuse when displaced by disaster, and Ms Procuta said protecting the vulnerable was a key priority in Tonga. "In terms of ensuring that in evacuation centres and other facilities there are separate toilets, cleaning areas for the women and things like that. But it's something that is top of mind for them, that they have got to be protected at all costs." 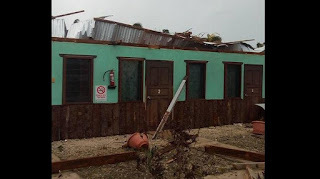 The minister in charge of disaster management in Tonga, Poasi Tei, said three people were seriously injured in the cyclone which hit. Police confirmed, yesterday, a 72-year-old man was rushed to hospital after the cyclone, but died of a heart attack before arriving. Thirty people sustained minor injuries. The government said 119 homes were destroyed and a little over 1100 suffered minor damage. Seventy thousand people live on the main island of Tongatapu which along with neighbouring Eua bore the brunt of the category four storm. There were still no confirmed reports of the situation on Eua.